I'm trying to find out what kind of mace patterns were available before 450 AD around the Roman empire (north africa and europe all the way to, but not including china). I've been especially interested in these types of knobbed maces. Anyone have info on when they first appeared? It does not have to be widespread. Try looking up the work of Kiripinchnikov and also more recently that of Popov. No idea what maces were around in 450, but there is a great axe/mace thing from Sutton Hoo 150 years later. Thanks for the insight. I'll look it up. Sadly the project I'm working on has a cut off at around 450. From what I've found, these types of maces first appeared 900 AD. This item is claimed to be from 2000 years earlier. If anyone has any insight on that, I would greatly appreciate it. This item is claimed to be from 2000 years earlier. I agree with Tod. Artemis is excellent at identifying antiquities, but they are not infallible when it comes to medieval weapons. I trust them in most cases, but mistakes can happen. I’m still not sure whether this is a part of a Roman bronze statue, or a medieval fist war hammer. There is no way that anyone can claim that this is Roman without a much better provenance. 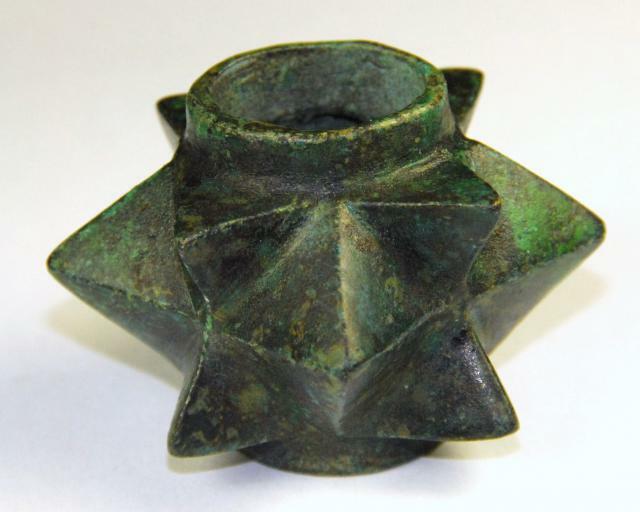 I do not know of any bronze maces which were popular between 600 BCE and 500 CE west of the Hindu Kush. Closer to 1000 BCE, a few bronze maces appear in graves in western Iran- I saw some at the national archaeological museum in Teheran. If you look at places which were very poor in metal, you might find some wooden or stone-headed clubs. Thanks for the replies, guys. I mainly wanted to know about that particular mace pattern, and I got what I needed.